Leonid Ieronimovich Turkevich was born in 1876 in Kremenets, Volhynia, at that time in western Imperial Russia. His father was a priest. His education followed the classic route of the day, first at the Volhynia Seminary and then on to higher education at the Kiev Theological Academy. Upon his graduation from the academy he began a teaching career as a layman in ecclesiastical schools. This followed with his teaching at a series of seminaries, including Kursk in Central Russia and Ekaterinoslav in Ukraine. In 1905, he married Anna Chervinsky which set the stage for his ordination first as deacon and then priest. His ordination to the priesthood was at the monastery of Pochaiv. He initially succeeded his father as priest of the church in Kremenets but he began thoughts of becoming a missionary, first to the new mission of Urmia in Persia, but then for America. In 1906, the young and dynamic Bp. Tikhon of the North American diocese found him a suitable candidate for the Rector of the new seminary in Minneapolis, Minnesota. He and his family arrived in the United States in October 1906, and he quickly assumed the position of rector of the Minneapolis seminary where he began the tradition for Orthodox pastoral education in America. 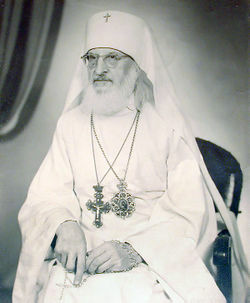 He was editor of the Russian-American Orthodox Messenger from 1914 to 1930. He was the dean of St. Nicholas Cathedral in New York where he was the main advisor of the ruling bishops. Fr. Leonid, with Fr. Alexander Kukulevsky, represented the American diocese at the Council of 1917-1918 in Moscow, Russia. The many church dissensions he experienced during his journey back to the United States through Siberia and Japan were those that he would combat through the remaining decades of his career. Fr. Leonid's experience at the Moscow Sobor placed him a leadership position at the 1924 Council in Detroit as he pursued a course for American autonomy based upon the decisions of the Moscow Sobor. However, this loss permitted his election and consecration as Bishop of Chicago in 1933. He was given the name Leonty during his tonsure as a monastic. Bp. Leonty had, since his arrival in the United States, been in the center of the life of the American church and was thus the best, if not the only, candidate for election as the new Metropolitan upon the death of Metr. Theophilus in 1950. Having aided in the adoption of the first Parish Statute at the first Sobor in Mayfield, Pennsylvania, in 1907 Bp. Leonty was greatly interested in establishing a firm organizational basis for the Church. In 1937, he led in the adoption of a constitution for the Church organized as a Metropolitan District with a Metropolitan, a Bishop's Council, and a Metropolitan Council. While progress, these organizational efforts were inadequate given the immaturity of intra-church relationships. Bp. Leonty was elected the new Metropolitan by acclamation during the Eighth All American Sobor in December 1950 as the delegates knew him to be one of the builders of the American church. During the following years Metr. Leonty guided the Church in the establishment of solid canonical and institutional foundation. Through the three Sobors held under Metr. Leonty's leadership, the Statutes of the Church were adopted and refined. A central administration was formed, matured, and placed on a permanent and stable footing. An administration structure was developed that consisted of the Synod of Bishops and a Metropolitan Council, that was patterned after the model of the Diocesan Council established by the 1917/18 Moscow Sobor and consisted of both clerical and lay representatives elected by All-American Sobors. At first, Metr. Leonty had a ‘central' administration that handled daily tasks that was filled by volunteer parish priests and dedicated laymen. The Eleventh All-American Sobor held in New York in 1963 gave final shape to the central organization by establishing three national officers of Chancellor, Secretary, and Treasurer who would be appointed by the Synod of Bishops upon nomination by the Metropolitan Council. Thus, a solid administrative structure for the American Church was in place by time time of Metr. Leonty's death on May 14, 1965. A structure that could provide for the growth of the Church. Metr. Leonty was buried at St. Tikhon's Orthodox Monastery (South Canaan, Pennsylvania). His papers have been deposited in the Library of Congress. In its 2008 Fall Session, the Holy Synod of Bishops of the Orthodox Church in America, after receiving the report of the Canonization Commission and several letters of request, blessed the Canonization Commission to make its investigation of the requests to consider the holiness of Metropolitan Leonty. This page was last edited on October 1, 2015, at 03:47. This page has been accessed 27,665 times.